Bandstands have been a feature of the British way of life for well over a century but after the Second World War an increasing number fell into disuse and were neglected. Sadly many were demolished as public parks and seaside resorts went into a spiral of decline in the 1980s and 1990s. However, in 1997 the Heritage Lottery Fund started investing in our public parks and gardens and this has seen the rediscovery of bandstands which has continued to this day. Former Director of the Heritage Lottery Fund, Dr Stewart Harding has described them as ‘wonderfully exotic structures that are at once very familiar and also alien in their strange designs – looking like UFOs, Moorish temples, rustic cottages or Chinese pavilions’. This revival is still under way and continues to this day. Over 120 bandstands have been restored and are now in use up and down the country and are once again becoming the focal points of restored and vibrant parks, not just echoing to the sounds of brass, but often bouncing to rhythm and blues, rock, opera, street theatre and drama. 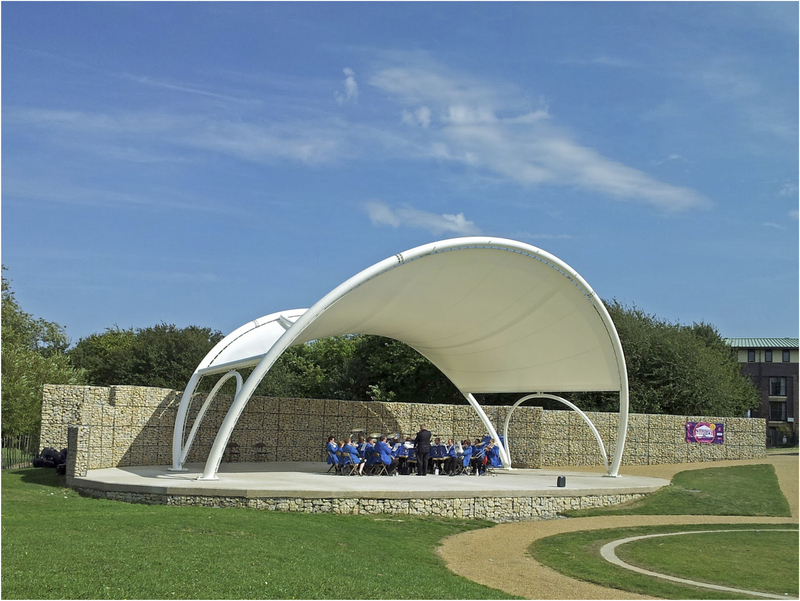 A bandstand is, however, merely an empty shell unless music is played on it and once again many local authorities (but not all) and other organisations are realising this. Their return is welcome. Many bandstands are back…. but many are still silent. Paul Rabbitts is a writer and lecturer and Head of Parks, Open Spaces & Projects with Watford Borough Council. A graduate in geography and landscape architecture, he has worked as a landscape architect and then in more senior roles with both public and private organisations, overseeing major development and restoration works including the HLF funded restoration of Albert Park in Middlesborough (which included the biggest skatepark in the country) and, more recently, the award winning restoration of Cassiobury Park, the Ancient Seat of the Earls of Essex. Throughout he has been obsessed with parks, their history and evolution, and has published over fifteen books, including the Shire book Bandstands in 2011 and books on the London Royal Parks. He continues to write and to count bandstands, is an accredited lecturer for the Arts Society and a regular speaker on parks and bandstands, and has appeared on numerous BBC programmes.